Montessori Messy: Amish Friendship Bread: A Lesson in Patience! About 10 days ago I was with my parents in Florida and enjoyed some homemade Amish Friendship Bread. Never heard of it? You begin with a "starter" that's just one cup of slime in a ziplock baggie, most likely given to you by a friend, neighbor or family member. It was sooooooooo good I was glad Mom gave me a baggie of starter to take home on the plane. The good news is that I passed through security with the starter in my carry-on luggage. The bad news: I had to wait 10 WHOLE DAYS to let the starter fester before I could bake the yummy, moist sweet bread (not sure "fester" is the scientific term...........). I guess it's a good lesson in patience for the kids AND for me. Sniff, sniff. Day 1 Do nothing (this is the day you get the starter) **DO NOT REFRIGERATE! Day 6 Add 1 c. flour, 1 c. milk, and 1 c. sugar. Mush. Day 10 TA DA! You made it! You've been so patient and haven't killed the starter yet! 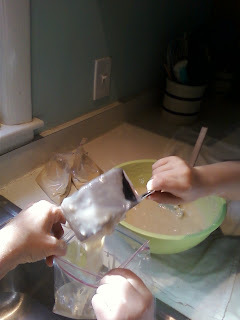 Mix and measure out 4 separate batters of 1 cup each to put into 4 separate ziplock baggies. You will keep one starter bag and give three away to your dearest friends (or the mail lady). It was pretty hard to take this picture while holding the bag with one hand! 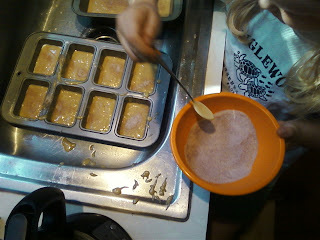 Grease 2 or 3 large loaf pans and mix an additional 1/2 c. sugar and 1 1/2 t. cinnamon. Dust the pans with half of the mixture. Pour batter into pans and sprinkle with the rest of the mixture. Bake for 1 hour (or as long as you can stand waiting for the delicious bread, whose aroma is wafting through the house by now). 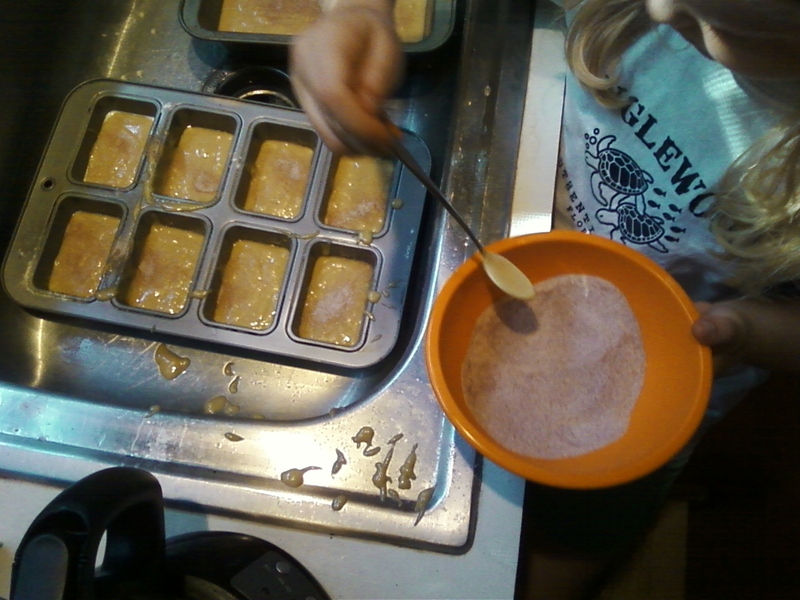 Dust pans with cinnamon-sugar mixture before filling. The batter rises a lot in oven, so not TOO full! 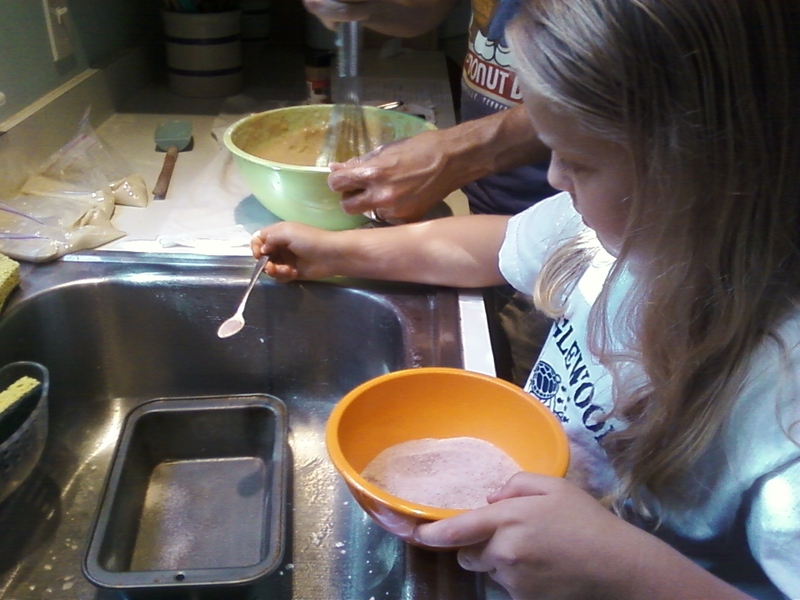 Then dust with the cinnamon-sugar mixture. We decided to live dangerously and use those mini loaf pans, too, so we just guesstimated the bake times for them. 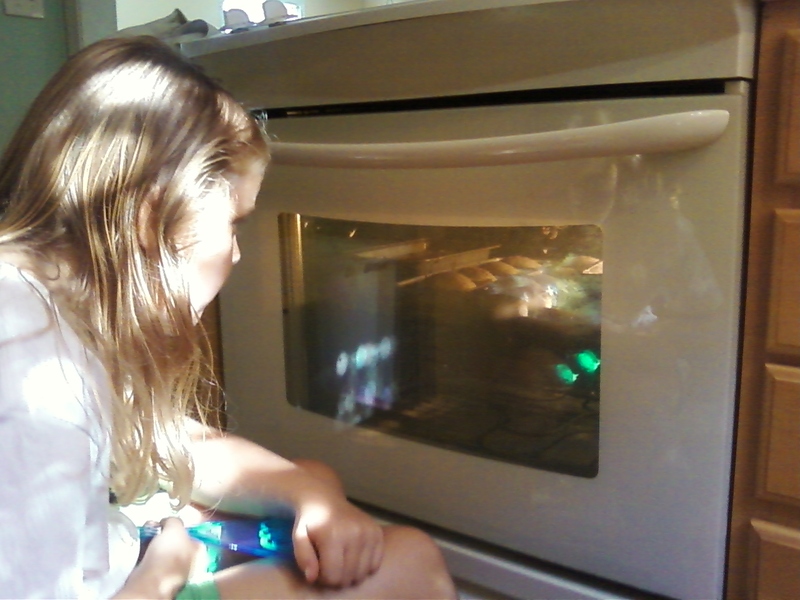 After about 40 minutes we just couldn't take it anymore--we were so hungry and they were pretty much baked. If you want to try this bread but don't have a starter, ask around. If you get really desperate, maybe I can send you some in the mail? I don't know if that would work, but I'm willing to try! It would have been nice if I had taken a photo of how the bread turned out, but I was too busy snarfing it down. Here's some information from Wikipedia on this kind of bread. Sooo..."starter" can't actually be "started" ? I have heard tales of a San Francisco baker who uses a starter brought over from France over 100 years ago!! 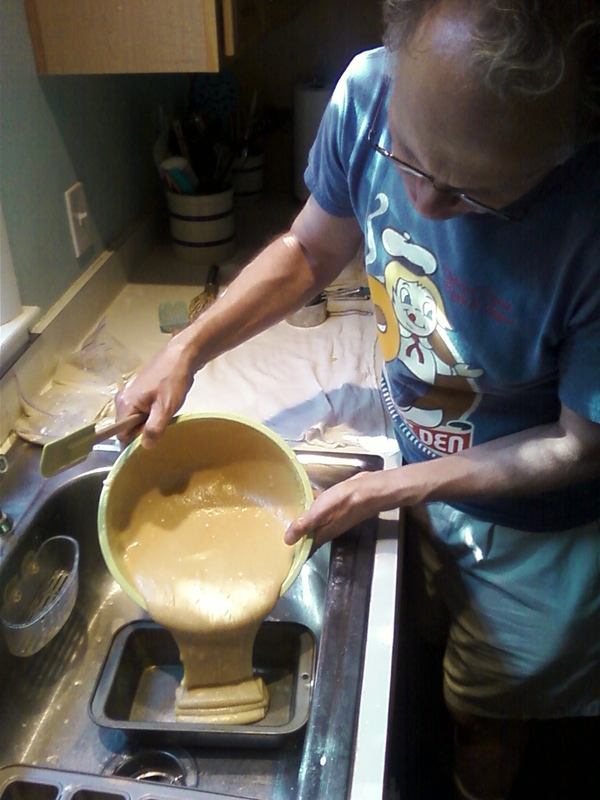 Yeast is forever clouded in an unfathomable mystery to me! !